Heather Albano » Blog Archive » Announcing Choice by Gaslight! I am delighted to announce that A Study in Steampunk: Choice by Gaslight is now available from the Choice of Games Hosted Games program. Look at its beautiful cover art! Unlike my other co-authored Choice of Games titles (Broadsides, Zombies, and the Affairs of the Court trilogy), Gaslight is my first solo endeavor. 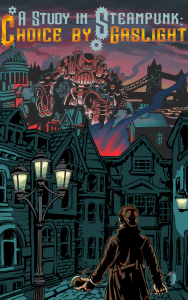 It’s an interactive steampunk novel where you play the protagonist – actually, at 277,000 words, it’s an interactive steampunk epic, because that’s about the length of three novels back to back. Gaslight has four distinct character arcs for the protagonist, with a bunch of variations within each. It features three different possible love interests. I rewrote all eleven of its chapters something like four times apiece. The defect sheet has over a thousand resolved issues. It took three years to get right. There are a lot of meaningful metrics. How about this one: I have quite literally been collecting material for this game since middle school. I read The Hound of the Baskervilles when I was twelve, and all the dominoes fell from there. Because of Hound, I read the rest of Conan Doyle; because Conan Doyle only gave us sixty Sherlock Holmes stories, I began to investigate the wider world of Victorian popular fiction. Because the society that produced those stories fascinated me, I took Christina Crosby’s Victorian Gothic seminar my junior year in college. Because that class blew my mind, I asked Professor Crosby to advise my senior thesis. Because I spent a year researching and writing about female monsters and monstrous women in the Victorian novel, I can still, fifteen years later, spot a Vic lit trope at thirty paces. I knew I was going to use it all someday. With the tropes of Victorian pop fic so firmly embedded in my brain, it was inevitable that I would come to want to write something that celebrated these tropes and investigated them at the same time. Somewhere along the line, I got an (absolutely crazy plot bunny) idea for who might have been behind the Jack the Ripper murders. It connected in my head with another story I wanted to write, about steam tech and healing magic. It was going to be a novel, but as I constructed the world – a world entirely painted in shades of gray, where you could interact with the dark gritty city as innocently as Sherlock Holmes chasing criminals, or equally well decide that Professor Moriarty had a point and the government of England was the true enemy, a world where it was feasible for a good man to slide down the moral ladder and end as Jack the Ripper, a world where steam tech might equally well be a weapon against dark sorcery or a threat to healing magic – a world where any viewpoint was viable, depending only on your perspective – I realized the most interesting thing about this story was its choice points. Sometimes you’re just born at the right time. A generation ago, I would have had to pick one path through the world and make it a novel. Now I have a platform that lets me share all the inherent stories at once. Many many many thanks to folks of Choice of Games, for providing the platform; to Rebecca Slitt in particular for all her help; to Doyle, Stoker, Stevenson, and Crosby, for the inspiration; to my playtesting army for their enthusiasm; to Jason Wiser for his art; and to Richard Jackson for more things than I can put into words. A Study in Steampunk: Choice by Gaslight is available for purchase here. Well done with the game! I just played it now (along with Affairs of the Crown) and thought that it was really good writing. A very nuanced game in general that made me feel like I wasn’t playing it, but living it. … so I just showed up here on your blog to say thanks! Hi! My friend introduced this game to me and I just wanted to tell you that I love it! Your writing is amazing and I adore the characters. I like that there’s such a good variety of different paths that the MC can take. It’s been a long while since I enjoyed a story so much. Thank you for making it! We were thinking of drawing fan art. I hope that is okay? Please BY ALL MEANS draw as much fan art as you like! (Selling it would not be cool, of course – I am legally compelled to draw the distinction – but I’m so flattered you want to make it!) May I see it when you’re done?